Yu-Gi-Oh! 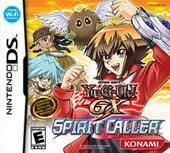 GX: Spirit Caller is the latest Yu-Gi-Oh offering on the Nintendo DS that is a combination of Harry Potter meets Manga and players must solve a variety of strange incidents at the Duel Academy. In its essence, Spirit Caller is your traditional card swapping game that gives you access to over 1300 different cards in order to engage in the gaming environment. For those inexperienced gamers, players will also have the Spirit Duelist to assist you through the game by offering advice and assistance where needed. Great for someone like myself! Wireless online play – battle anyone in the world! Import your card deck from Nightmare Troubadour! 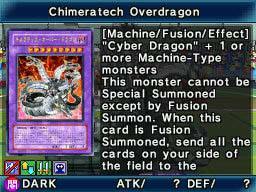 What really sets this title apart from previous Yu-Gi-Oh titles is the use of the innovative touch screen which is extremely accurate and really improves the gameplay of the title, especially in a title that relates to cards. Tap the card you want to select and a window will appear above it, asking whether you want to set or summon. If touch play isn't your bag, the D-pad and button combo is still in effect. 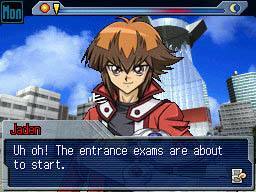 This way makes the game feel more like the other versions, including Tag Force. The 2D world map hasn't gone anywhere since the last DS adventure, producing roughly the same uninspired image as before. Apart from card games, the gamer must also engage in the gaming environment such as your dorm room which has a lot of objects to click on such as the closet, which lets you check your character's status and change his spirit or equipment. Tap the bed to save or go to sleep, advancing game time to the next day. Select the PDA to read fictitious e-mails or get duellist information. Touch the computer when you want to have a wireless or Wi-Fi duel, or just to check your friend roster. The area that counts most is of course the gameplay, although not much has changed since the previous version. Card battles are a challenge with unexpected foes who unleash a seemingly impenetrable assault. In reality the attack is not impervious, but the act of having an attack reversed or eliminated can be startling. You might have the stronger card or cards, leading to a more powerful army of monsters. But enemies who have a special trick or some unique advantage can still get the better of you. Cards are typically too small to read their tiny info but you can enlarge their image and bring up a status description by tapping the magnifying glass on the bottom left corner or simply by pressing the X button. The bottom screen is where the game is conducted, but you can get a 3D view on the top. Albeit, not a very attractive view. But it's supposed to add something to experience. And maybe it will if you're a kid who hasn't played many titles. In conclusion, Yu-Gi-Oh! GX: Spirit Caller is definitely for the fan or for those gamers that wish to try something different and this title is definitely different in aspects of gameplay, graphics and sound! Interesting stuff!